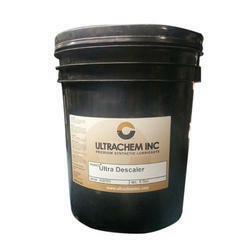 Offering you a complete choice of products which include ultra descaler. Biodegradable water scale Cleaner An inhibited, low foaming mineral acid compound for removing hard water scale, lime, rust and other oxides. This product is designed to be used as a competitive product to Rydlyme®, Sublime® and other similar products.Ultra-Descaler is designed to remove hard water scale from industrial equipment such as boilers, heat exchange units, water cooled compressors and connecting pipe lines. This version is more pleasant to handle because it fumes less and smells better than competitive products. Yet it can be diluted with water by as much as 50% for performance similar to competitive products above. Hard water scale is removed down to the base metal with no scraping or rodding needed. It also removes metal oxides, such as rust from ferrous metal equipment and ferrous stock metal. Ultra-Descaler is suitable for use in USDA federally inspected meat and poultry facilities for descaling heat exchangers. Ultra-Descaler is compounded with inhibitors, surfactants, defoaming agents, various diluted acids, a pleasant cover scent and a dye to help differentiate it from other materials.